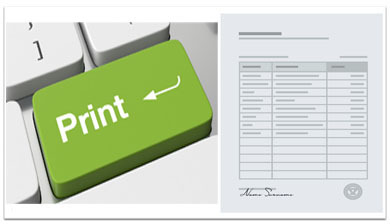 We have created these free printable forms for people who do not have the ability to format forms properly and need something immediate to print out. The formatting on our forms should be sufficient enough so when you print them out, you can fill them in without any further editing. The forms on this page are free of charge for you to use for your own personal or business use. However, you cannot resell, distribute, or post them on any website or newsletter without our written permission. If you do not see a form you are looking for here, please stop back in the near future as this website will be expanding its selection. Most of the forms (not all) in this section have at some point been drafted or reviewed by a licensed attorney. You will find them to be of higher quality than most forms on the Internet. However, if you have a complex situation or an important situation, you should give serious consideration about consulting with an attorney in your state. Select any of our forms below for free. Free Printable Divorce Forms Free printable divorce forms that are Court approved. Forms and papers available for all states. In many cases the free printable forms may be adequate for common everyday circumstances, are simple to fill out and to utilize for your situation. Nevertheless, they are not proposed as, nor should they be, a replacement for the advice of an attorney. There is simply no substitute for the guidance of a good attorney. Laws are always changing. The owner(s) of this website are not attorneys and cannot give legal advice or recommend which form the visitor or user should use. We provide these forms for informational purposes only and make no guarantees whatever as to their legality. At the very least they should provide you with an excellent starting template. Also, if you do not see the forms you are looking for, you should search other categories on our website as we have many free business forms and free contracts. Please stop back soon as we update our website frequently.